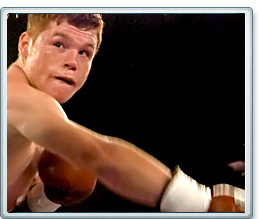 By John J. Raspanti, Doghouse Boxing: Saul “Canelo” Alvarez (39-0-1, 29 KOs) successfully defended his WBC junior middleweight championship by stopping former world welterweight champion Kermit Cintron (33-5-1, 28 KOs) on Saturday night at the Plaza Mexico in Mexico City. Nicknamed “The Killer” the 32-year-old Cintron had said before the fight that he would knock Alvarez out. He attempted to set the tempo in round one by jabbing and throwing some hooks. Alvarez, showing the patience that is becoming one of his trademarks occasionally countered back. Alvarez landed a nifty double left hook and hard right hand halfway through the round. Round two was closer as both boxers stayed in the middle of the ring. Alvarez was trying to time Cintron to land his big right hand. Cintron, kept throwing punches, but most were short though his jab was finding Alvarez’s face. He seemed tentative and unsure of himself. Alvarez was back in control in round three methodically attacking Cintron with hooks to the body and head. Cintron landed a nice check left hook that had no effect on the 21-year-old champion. In round four Alvarez again landed his double hook to the body and head of Cintron. The former champion looked tired as he tried to move around the ring more. Alvarez landed another hook to Cintron’s body and then came over the top with a big right hand that sent Cintron to the canvas. The punch discombobulated Cintron, turning his legs to jelly. He gamely pulled himself up, but by the end of the round was hanging on for dear life as Alvarez landed yet another double hook at the bell. The Puerto Rican challenger landed a big left hand that stung Alvarez at the start of round five. Soon though the much stronger Alvarez was back in control landing his own right hand that knocked Cintron to the ropes. Cintron’s movement looked shaky and unsteady. Alvarez let fire with a three punch combination, the biggest being a right hand, that shook Cintron badly. The referee, noting Cintron’s condition, jumped in and halted the fight at the 2:53 mark of round five. Alvarez’s victory was the biggest of his career and arguably his most impressive. After complementing Cintron, he called out a familiar foe ( Floyd Mayweather Jr.) during his interview with HBO’s Max Kellerman. Adrian “The Problem” Broner (22-0, 18 KOs) scored an explosive knock out over tough Martin Rodriguez (34-3, 18 KOs) in the third round. The victory earned the 22-year-old Broner the WBO Jr. welterweight championship. The fighters exchanged rounds with Broner dominating the first with quickness and power, while Rodriguez was more busier in round two. Broner wobbled Rodriguez with a counter uppercut one minute into round three. He followed up his advantage with a big combination that knocked Rodriguez to the canvas. The time of the knockout was 1:43 of round three. The fights were part of the HBO’s “Boxing After Dark” series.